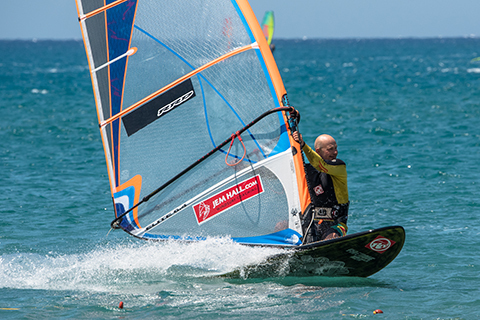 As we move into summer there is often a feel good factor in our sailing and us and in this period we may look to open our minds to look to improve and enjoy our great sport even more. 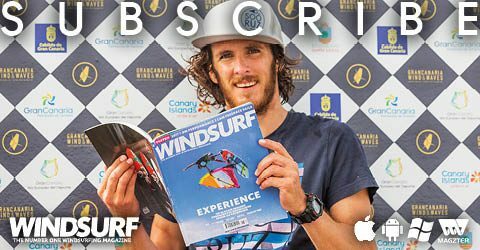 (This feature originally appeared in the July 2017 issue of Windsurf Magazine. To read more features like this first, Print and Digital subscriptions are available. The most simple of actions that I use when self-coaching is to look in the relevant direction pertinent to the move / skill I am performing. A rather simplified tip used in dynamic sports is to look where you want to go and it is very effective. Whilst coaching in Jeri I got to reflect on this more as an eccentric American chap bowled up and said ‘Jem, you coaches all talk about looking in windsurfing but it is more powerful to describe what we should be seeing.’ So this month I am dedicating this piece to him and adding my own flavour by describing what we will be feeling in our moves too. I will cover the main tips for popular moves across the levels and implore you to take these on board. If I put it into context, a solid wave sailor may have problems oversheeting in their top turns all caused by not looking out of their turn, this will likely stem from gear gazing whilst blasting for too many hours. This is why I suggest to all new clients to do a flat water clinic with me first so we can nail the stance, tuning, mindset and transitions in a kinder environment before taking on the bubbling cauldron of the waves. I used to teach a lot of beginners in my first 10 years of coaching and I kept it very simple with basic tips that were easy to apply and replicate because I knew how important these would be as they progressed. I also demonstrated a lot how best to do these and sometimes showed them what they were doing on their kit. Let’s examine the ‘gateway’ skills and actions we should be nailing as we start our sport and all the way through it. I will be highlighting where to look, what we should see and, where relevant, what we will feel. • Stance: Look upwind and see the gusts and lulls on the water whilst reading the water state ahead. We can then feel how much better it is to anticipate changes in the wind and adjust our stance and sailing line to suit. 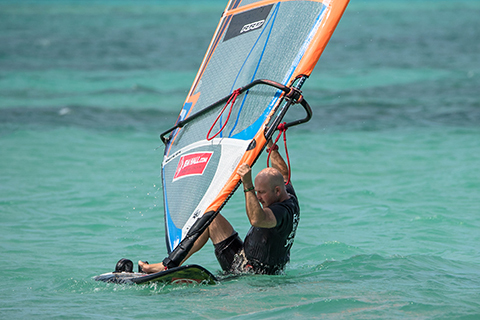 I believe this is so crucial to how we improve and react in windsurfing. In lighter winds I often sail behind someone and count how many times they look at their sail, feet and board, the results can be not pretty! • Using the harness: Look ahead in your stance but then when hooking in look at your harness line and see it coming up under your bar. After this action, drop your hips and look back upwind and see the wind strength to know how much weight to commit to the line! For unhooking, it is best to keep looking upwind, committed to the line, and just bend your arms to unhook. • Tack: Look forward in the entrance and then the exit, and you will see your board’s position relative to the wind to enable you to know when to do your foot change, i.e. just before head to wind. These actions will help you feel your hips swing forwards and out to lighten your back foot for slick footwork. People say their feet are slow; it is often their vision is not cast in the right direction. Look and see effectively for fluid hips and fast feet and this will help you reach Nirvana in gybes and wave riding too. 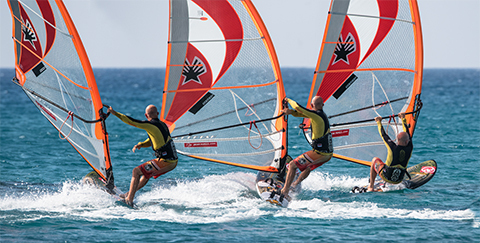 • Beach start: Look upwind to see the wind strength and keep your board pointing slightly upwind. When ready, look forwards and see the mastfoot as you feel your body move forwards and in as the rig assists in pulling you out of the water. Once on board, look back upwind and see your sailing direction to help adjust to the sail’s pull. Keep all the above in check and you are onto a winner. For the intermediates and advanced sailors who rarely sail in lighter winds you will be amazed just how effective all the above actions are and how they will improve your ‘windy’ performance. Let’s examine what we can do in our windier core skills. • Water start: I reiterate the points above of looking upwind and seeing the wind strength to adjust how much sail to show to the wind. Really look forward and eat the mastfoot to come up out of the water in lighter airs. You will feel yourself not coming up and out of the water unless your head moves forwards and in. You will also feel yourself getting catapulted whilst waiting to waterstart if you gear gaze is too long! 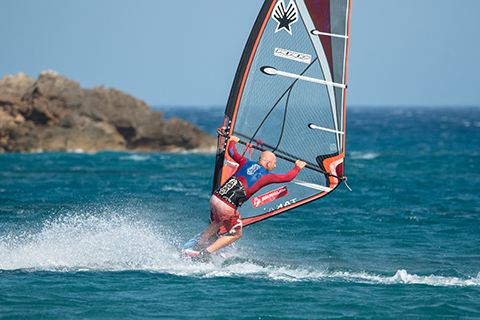 • Stance Boost: Look upwind and see the wind as you assess just how light a lull might be or how strong a gust is and then change your direction accordingly before either of these meet you. A slight bear away before a lull will help you slip through it. 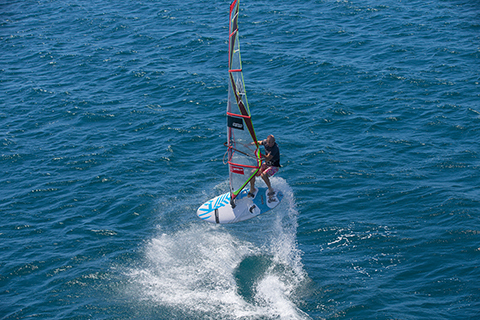 Heading upwind just prior to a big gust will help you control its power. Both will make you feel the flow as you work with the wind. • Non-planing gybe / Foundation Gybe: Look forward to steer downwind and see the nose bear away. Then as you steer through the gybe, look out of the turn and see the clew as you feel your hips go into the turn as the rig moves out. In the exit phase as you sail clew first and then rotate the rig, maintain looking out of the turn and forward as you see and assess your best exit sailing line. Nail this great habit and you will look out of your gybes and carve gybes and not spend countless turns ending up atop your sail. You will also, unbeknownst to you, be readying yourself for wave riding! 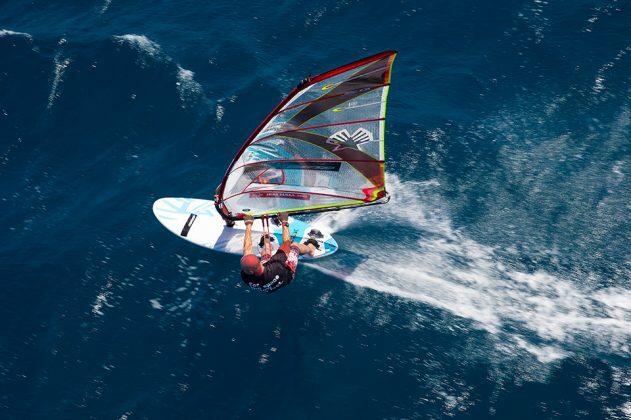 • Top Tacks: If you are looking to boost your powered up / planing tacks then really aim to feel the rig go back and hips swing forward all exacerbated by looking forwards and seeing the board’s nose and its position relative to the wind. In the transition phase, look back and see your old back hand grab the new side of the boom a split second before your foot change. As you move into exit mode, look forwards again (fast) and see the rig fly past you. Feel your feet getting space on the board to step into, all this leading to a strong ‘recovery position’ and less nose sinks. I do not want to touch on this area in as much detail as the hard yards and major progression are gained from addressing the previous key skills, yet I will throw in some of my toppest of tips to see you gain a performance boost. • Carve gybe: Look forward and see the water to ensure you are attacking your gybe off of front foot carving. See the clew in the middle phase and keep looking forward in your exit to enable you to carve out on your heels. You will feel in a position to trust your hands and not look at them. • Helicopter Tack: This move is public enemy no. 1 for gear gazing, so look forward to see yourself sailing upwind backwinded and then keep looking forward throughout your rig rotation and you will feel a slicker rig change and less landing on the sail. 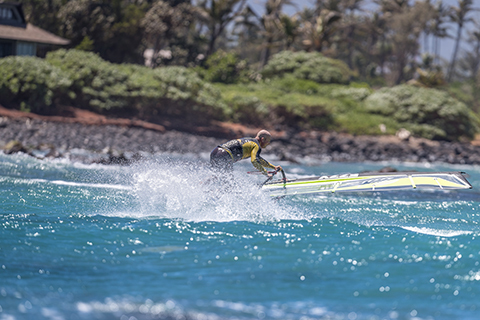 • Carving 360: Look forwards to see the water and then look back and see the top batten to feel your carve tighten and be in a position to finish the move. • Duck Gybe: My main mantra here is ‘duck, look, pull.’ So duck the rig (and your body) and look out of the turn to see your exit as you feel your hips swing across to help you keep the board carving. • Jumps: For jumping, look up to go higher and see a spot just upwind of your front hand. 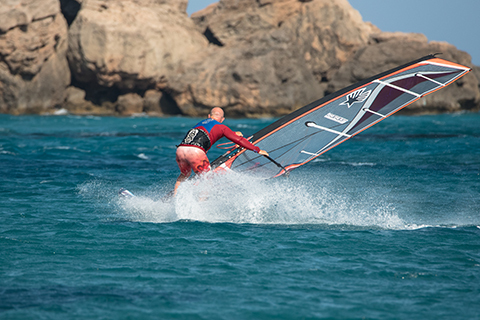 Look forward at the apex and see where you will be landing as you feel how best to steer the board and trim the rig. • Forward Loops: Look back and see the clew as you feel your body tuck up and roll to rotate. Look forward to open your rotation and see your landing. Writing this piece has helped me set my targets; I need to see the clew more in my forward loops and see the lip of the wave so I can adjust my turn accordingly. What are your targets? RRD boards, wetsuits, softwear, Ezzy sails sponsor Jem Hall. Get him live and direct on one of his highly acclaimed coaching holidays but be quick as they are selling out – check out his fab new site www.jemhall.com for details. You can also follow him on twitter / Facebook / Instagram..